Deck your outdoors beautifully and stay safe with these tools and step-by-step techniques. ‘Tis the season for all things twinkling and bright. In countless communities nationwide, hanging outdoor Christmas lights is annual event, and neighbors vie for the best-lit house on the street. Before you drag the extension ladder out in frigid temps, however, be aware that there’s a right way and a wrong way for how to hang Christmas lights outside. With a little pre-planning, and the correct tools and materials, you can tackle the task safely and create an illuminated masterpiece that will be the talk of the block. Check out our steps and tips for hanging this year’s holiday lights. SAFETY FIRST: Extension ladders and step ladders must be sturdy and safe. Don’t climb on a rickety ladder, and never lean to the side of a ladder in an attempt to stretch farther than your normal arm’s reach. Instead, climb down and move the ladder over before continuing your job of hanging Christmas lights outside. Design a lighting plan. Whether you want a full-on winter wonderland or prefer a minimalist look, it’s wise to sketch out on paper or at least list the types of lights you want and where you’ll put them before you hit the store, trying to decide in an aisle full of dazzle. Stand across the street from your home to help visualize your plan. Do you want to adorn just the eaves or do you aim to decorate porch columns, railings, mailbox posts, fences, and even your trees and shrubs? With a long measuring tape (50 feet, or longer, works well), measure the distances where you will hang lights, such as along eaves, door and window frames, and the vertical corners on your home. Record the measurements so you don’t buy too many or too few lights. Divide the height of the column (in inches) by how far apart you’d like to space each wrap of the light strand. We think 3 inches apart is a nice look. Because our example is 10 feet tall (120 inches), our formula would be 120 ÷ 3 = 40. Then, multiply the total (40 in our case) by the circumference of the column (in feet). For our column that’s 1.5 feet in circumference, that would be 40 X 1.5 = 60. For our 10-ft. column, we’d need 60 feet of lights in order to wrap the strands 3 inches apart. Your results will vary depending on the height and circumference of your column or tree trunk. Decorating shrubs and bushes with string lights is a matter of personal preference, and you’ll have to take into account the width and height of your shrubs. That said, a 6-foot evergreen needs about 400 lights to achieve a merry and bright—but not to cluttered—Christmas tree effect. To reduce the number of electrical outlets you’ll need, select light strands that connect to one another. Read the manufacturer’s instructions and limitations. In many cases, you can safely connect up to 25 LED light strands, and up to six strands of incandescent lights. Test the lights before hanging them. This is especially important if you’re using stored Christmas lights from previous years, but even brand new strands can be faulty. Plug in each strand individually. The last thing you want is to spend time hanging lights that don’t work! Use plastic light clips to hang strands along eaves and gables. These inexpensive clips are designed specifically for hanging Christmas lights, and they hook over the top lip of your home’s gutter, or, alternately, they slip under the edges of roof shingles. Read package instructions to determine the specifics—some are suitable for both types of connecting. Don’t use nails or staples to attach the lights: You could end up damaging the gutter, the shingles, or the lights. Observe safe ladder practices, as noted above. Install lights on railings by either winding the strand around the handrail or—for a perfectly straight line of lights—by using deck clips. Deck clips are designed to securely grip a standard handrail and support a string of lights. Plastic zip-ties are also a good choice for attaching light strands to railings and balusters. 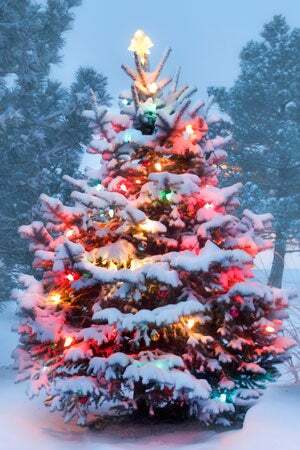 If possible, use a light-hanging pole to secure lights on higher tree branches. It’s dangerous to climb out onto branches to hang lights in trees, but a light-hanging pole lets you remain on the ground, or on a safe rung of your ladder, while slipping strands over and around the branches in a free-form manner. Use an exterior-rated extension cord to plug in your lights. Interior extension cords are not safe for outdoor use. To make your lighting even more secure, wrap a bit of duct tape around the plug-ins where the cords connect. This will reduce the chance of moisture getting into the plug and blowing a fuse or breaker. • Use a timer to turn your Christmas lights on at dusk and turn them back off a few hours later unless you want to leave them on all night. Yard stakes that feature multiple outlets and timers are designed specifically for controlling outdoor holiday lights. 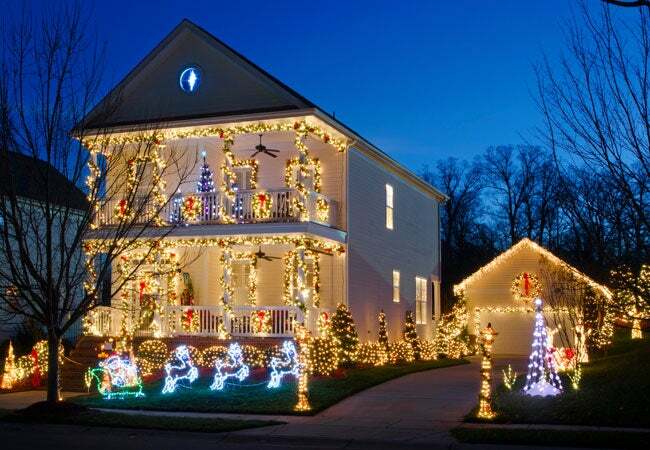 • Perhaps the best tip for how to hang Christmas lights outside has nothing to do with mounting them to your home and landscape and all to do with storing them. Done right, this preparation can eliminate time wasted sorting tangled lights. So, when you take your lights down after the holidays, wind them around large cans—such as coffee cans—before packing them away. This will make them easier to unwind when you take them out to hang next year. Or, if you don’t have any such cans, try one of these other three methods for storing Christmas lights. Anyone who’s tried untangling a gnarl of light strands will appreciate this tip!